b) You’re not aware that it helps the person you’re having a conversation with. Really, it helps the flow of conversation, it helps open the door to something the other person might be interested in. By speaking well about your business, you open up communication. In July I’ll be speaking at an event for emerging entrepreneurs about how to do this. I hope to help them understand the value of opening up a conversation about what they’ve been passionate enough about to turn it into a business. This blog post is a great start for taking the time to really think about how we might help spark an interesting conversation. If you an entrepreneur with an amazing idea and want to pitch it to your friends or even an investor, get ready to experience sweaty palms and rosy, red cheeks. Why? 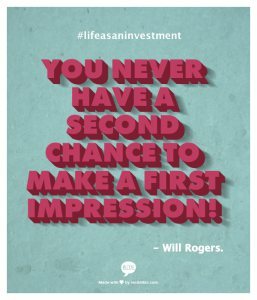 Because you never have a second chance to make a first impression! I. Make a plan and write it down. Here is a plan: The American Express advice US makes it simple and useful.